Professional painting tips are helpful in tackling a DIY project of your own or when you want to hire a professional painter. The Internet has created some savvy DIY’ers. But you can never really know that much about a skilled trade until you actually try to do it yourself. Whether you decide to hire a painter or DIY, these professional painting tips can save first time painters money and time. There are numerous brands to choose from. Each brand has several grades of paint that range from low to high quality. Reviews such as, Paint Buying Guide by Consumer Reports​ can help you. Reviews are great but when you choose a brand it comes down to the paint that works best for your budget, your project and your preference. Trustworthy and experienced painters will use the best brand and type for the project. Measure your room dimensions to determine how much paint you need. Use your measurements to determine how much paint using a Paint Calculator. Typically one gallon will cover about 250 to 400 square feet depending on the type of surface. Keep in mind, different brands have different abilities to cover and hide previous color, marks or flaws on walls. A professional painter should know from experience how much paint will be needed. Tape – Use tape to lay down paper or plastic to cover areas you don’t want painted. 5 in 1 – An extremely useful tool that all painters utilize. Roller Cover and Roller Frame – Rollers need extension poles depending on height of the room or if you are painting a ceiling. It’s not completely necessary, but they can make your project easier and faster. Bucket and grid or pan – Our painters like buckets because they are convenient and have dual functions. A huge professional painting tip is to do your prep work! Prep work is the most important step in painting any surface. Painters can attribute a large amount of issues to 2 things; wrong product and more commonly, incorrect prep work. You can prep surfaces a number of ways such as, cleaning, scraping, scuffing, or priming. Don’t let this part of your project discourage you! Do your research and look for more professional painting tips on prepping. You can also get help from people in the paint store. Ask an employee of the paint store or paint section for the best answers to your questions. 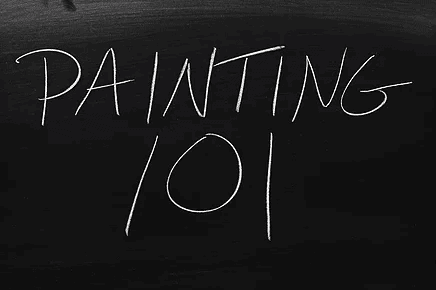 Now you have some basic knowledge of painting to start your own project and to understand what painters are doing. Need more professional painting tips? Feel free to comment or email us with questions and one of our “Painters who know Paint!” will get back to you! Good luck with your next project! No Replies to "Professional Painting Tips: "The Basics""